Apr. 3 (NBD) – "A bottle of milk makes you forget the wrong person, and another bottle of milk brings you another one." The amusing slogan of a milk drink by Chinese food company Want Want miniatures Chinese traditional companies' desire of not only staying classic but also going viral. 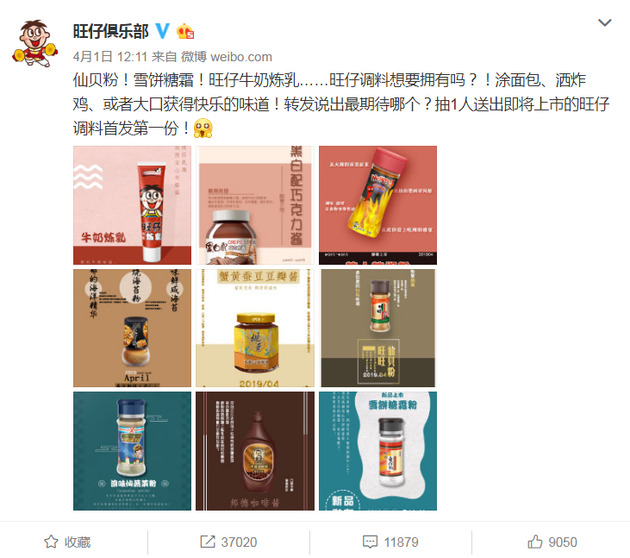 On Tuesday, Want Want, a nostalgic brand which placed a stamp on the childhood memories of China's post-80s and -90s, announced it will promote its popular snack-flavored condiments and furniture. It is not the first time the food and beverage vendor taps the crossborder marketing fever. In April 2018, Want Want promoted facial cleansers, toothpastes and facial masks. Later in October, the company teamed up with other brands to offer hoodies, sweaters and purses, which were all snapped up in mere seven seconds and allured nearly 700,000 customers to its Tmall shop, more than ten times as its regular traffic. Apart from vending peripheral goods online, Want Want also opened its brick-and-mortar shops in 13 provinces across the country, with merchandise ranging from snacks to cultural and creative products. Behind such a hit lies Want Want's ambition in revitalizing the sales of food and beverage through crossover marketing. According to its financial report for fiscal 2017 ended March 31, the company's profits went down by 6.6 percent year on year and its gross profit ratio of beverage and milk drink division even dropped to 45.4 percent from 50.6 percent over the previous fiscal year. However, consumers' decision on whether to continue purchasing Want Want products is determined by the quality and whether the company can ride the trend of healthy products like Coca-Cola and Soymilk from Dali Foods Group. In fact, the trending crossover sector is now crowded with many players. Beijing's Palace Museum has gained a footprint in a large variety of crossover goods, ranging from stationeries like tapes, bookmarks and writing paper to cosmetics including lipsticks, blush and eye shadows; Chinese creamy candy brand White Rabbit also made an effort to produce lip balms infused with the essences of olive and sweet almond. Beverage seller Wahaha even made inroads into the AI robots sector. Whether crossover marketing will come to the fore depends on the concord between the brands and the new offerings, the charms of the brand itself and the compatibility between the collaborated brands, commented Professor Zhang Ying at Guanghua School of Management of Peking University, and crossover marketing conduces to enlarging consumer groups, improving user experience, shaping brand images and expanding brand recognition. But Zhang also called for rationality in the domain as not all the crossover products perform well. For example, chili sauces producer Laoganma released a hoodie with its logo on the clothes last year, igniting extensive discussions though, failed to achieve long-term success.